Fredericks was one of six artists commissioned to design sculpture for Northland Shopping Center in Southfield. At the time it opened in 1954, Northland was the country's largest shopping center as well as the first regional shopping center. The architects planned for sculpture to play an important role in the shopping center's courts and malls. It is obvious that Fredericks designed this sculpture with children in mind. As with his other large animal sculptures, he gave the bear a benevolent quality so it would not frighten children. This bear could be a child's best friend. The contrast of the massive body of the bear with the almost frail body of the boy on his back emphasizes this special relationship. The bear's head is down, communicating only amicable intentions. Its erect ears and furrowed brow suggest interest in a viewer at this low eye level. Frederick's portrayal of the bear is not totally realistic, but like several of his other sculptures of animals, he has portrayed the bear as in a child's imagination. The sculpture at Northland still attracts as much attention today as when it was first placed there, pleasing children and adults alike. In a display case at the front of the gallery is a smaller and earlier version of this sculpture in bronze. A cast similar to this is on display in the children's room of the Grosse Pointe Public Library. 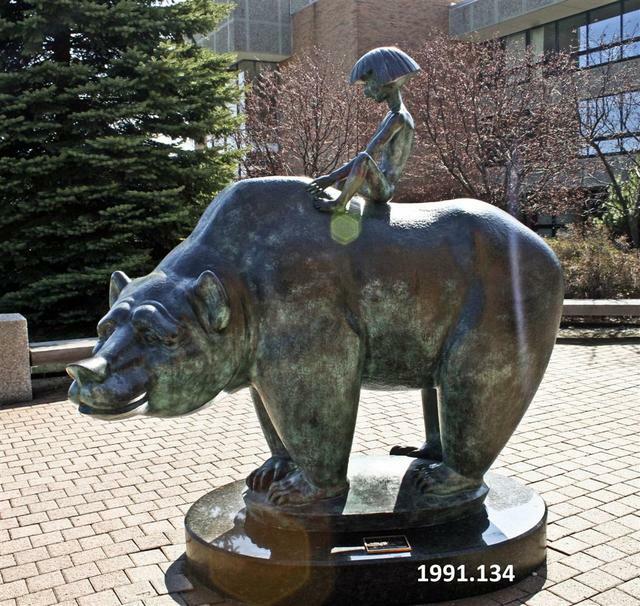 79" x 42" x 78"
Fredericks, Marshall M., 1908-1998, “The Boy and Bear [Bronze],” Marshall M. Fredericks Sculpture Museum, accessed April 21, 2019, http://omeka.svsu.edu/items/show/5174.